SKU: 10066157 12" x 18"
Available only at The Container Store, our Platinum Elfa Ventilated Shelves come in three convenient depths and four convenient lengths. You'll be able to find just the one that fits your space. Use the 12" depth for hall closets, children's closets and shallow pantry storage. The 16" depth is ideal for linen closets or standard closet storage. The 20" depth is perfect for garage storage shelving or wherever deep shelving is desired. Two Platinum Elfa Ventilated Shelf Brackets are required to support every 36" of ventilated shelf length. We can cut these shelves to any length free of charge. Contact us for details. Platinum Elfa Ventilated Wire Shelves is rated 4.9 out of 5 by 342. Rated 5 out of 5 by JNaz from Great looking and sturdy! I needed a storage and organization system for my garage and tried the Elfa system. I liked it so much, that I expand it. I really liked the ventilated shelves in various sizes that accomodate many items. I also liked the solid work surfaces. 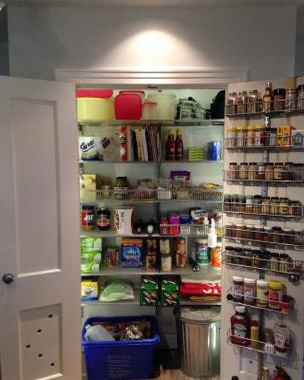 Rated 5 out of 5 by Yayasyn from Pantry Make over I am so happy to have a workable pantry. I can find anything in my pantry now but before I was so frustrated. I have another project in the works now. Rated 5 out of 5 by Rrsdvm2 from Awesome shelves for a tight space These were easy to install but make sure the top frame is long enough to allow for 1/2” on the outside of your hanging rod. These shelves are sturdy, beautiful and worth the price. Rated 5 out of 5 by Wenatchee from Elfa system works and looks great! We installed an Elfa shelving system (platinum standards, brackets and wire shelves) in our kitchen pantry/closet. It worked great and looks great. One suggestion: As advised by The Container Store, I tried bolt cutters to shorten the width of a few of the shelves. But in that first practice cut, the cut was very ragged (maybe the store should sell small plastic end caps?). So I tried my power jigsaw with a metal saw blade. That worked much better (and much easier) and after a minor amount of filing it was hard to tell which end was trimmed vs manufactured. 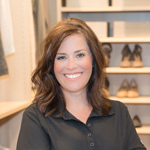 Rated 5 out of 5 by ClosetGal from Master Closet Re-Defined Our master closet is where everything is stored! This was our closet-defining statement, but we finally decided to elfa-ize this space. Now, it looks great with the birch door fronts and sliding shoe trays (our favorite item), and the decor shelving below the hanging items. This closet still holds pretty much everything (although we've cleaned and cleared A LOT), but now it doesn't look like it. AND some of the elfa items we had in this space previously (pull out drawers, towers, and shelves) have now gone into other rooms (utility, pantry and garage) and helped reorganize and clear up those spaces which means that ELFA is very versatile and can be re-purposed years later. Yup, we love our closet. Rated 5 out of 5 by Suzyart from Best purchase ever My son has small rooms, not enough closets. I used to work at TCS and partially paid for a laundry room during the friends and family sale for my newlywed son. My daughter in law loved it! It was her first elfa space. Rated 5 out of 5 by TM0127 from Big fan! Since 2006 I’ve been a huge fan of Elfa. I worked with The Container Store on the designs and personally installed Elfa in my master closet, pantry, office closet , and garage. Super easy and I love that you reconfigure if your needs change or they have a new product that would work well. My favorite is the pull out mesh shoe rack...I have two - one for my athletic shoes the other for all my flip flops. It’s a great space saver.! Rated 5 out of 5 by Ebalina from Very versatile. Recommend using shelf liner if storing small items on the shelf to keep items from slipping through. Rated 5 out of 5 by Biss from Used everywhere! Durable, easy to install, moister resistant. used in closet, garage and even outdoors! Rated 5 out of 5 by TiffL from Fantastic Shelves These shelves are very sturdy and fit very tightly onto the hanging standards. They are also very adjustable, so can be changed and adjusted. TCS will cut them to your measurements. One tip is to make sure that they file the end they cut, so that it doesn't scratch you or the wall. The clothes rods also hang very securely from the shelf. Rated 5 out of 5 by Stacyt88 from Pantry We did a kitchen remodel and for the new pantry we had a container store designer help us maximize our space in our pantry. So happy with the results! Rated 5 out of 5 by CoffeeAndElfa from Excellent for cleaning supplies We have had problems with insufficient storage in our home. The solution proved to be installing elfa shelving in some rooms and closets. For example, we modified our 2 hallway closets to store cleaning supplies and pantry overflow, respectively. I used a staggered form of shelving by installing an extra hang standard and 3 different widths of ventilated shelving. This method greatly enhanced the visibility of items by using a 20" for the bottom shelf, with a 16" above that, with a 12" above that. Our cleaning supplies and extra kitchen (mostly beverages) are now neatly arranged in an 'easy to see' form. The biggest hardship was getting the top track installed in the limited space of the closet. Once the tracks are in place, the rest of the installation goes extremely smoothly. The shelves are very sturdy and quite capable of storing the juices we buy when on sale. 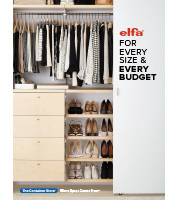 Elfa has proved to be the main solution to our storage needs. Rated 5 out of 5 by KA97 from just right for a narrow pantry A quick and easy install (I DIY'ed it in an afternoon), and an economical solution to the lack of shelves and odd size in my narrow kitchen closet. Rated 5 out of 5 by Liand from More Space! I’ve now had seven or eight wall shelving units installed in two separate homes! Love the extra storage space the shelves give. I just had wall shelves put in my sewing/craft room and haven’t filled them up yet. It’s better to have too much space than not enough! Rated 5 out of 5 by gmsavs from What an amazing difference I have a work area off my kitchen that only had the counter and one wooden shelf high up-- Not the best use of space. I measured the area and decided that the Elfa system was the way to remedy the situation. I installed 3 rows of shelves and, of course, it needed to have that finished look, so I added white fascia. I moved the wooden shelf to under the counter top and below it I have a storage container and a recycle bin. I am SO excited about this new work area. We have used Elfa in our pantry, and our closets not only in this house, but our last one. IT IS THE BEST THING EVER!! Rated 5 out of 5 by SweetM from Love Elfa! I have Elfa shelving throughout my house and love it. Just purchased more for my office. Rated 5 out of 5 by Lancelena from Awesome Closet Make-over! My closet was a nice size for a walk-in, but the shelving was old wood and the layout was inefficient. After deconstructing, painting, putting new carpeting on the floor and re-designing the layout, using Elfa Ventilated Wire Shelves, my closet became my favorite place in my condo! I recently sold that home (that Master bedroom closet was a huge seller) and now plan to use a similar design in a few of my new home's closets. I didn't remember to take a "before" pic, but here are "after" pics. Thanks, Container Store & Elfa! Rated 5 out of 5 by MainMom from Shelves in varied widths are great Love the design of our son's new closet. A 12 inch shelf at top and a 16 inch shelf provide tremendous options in lieu of the old fixed shelf that was just too deep to be functional. My 10 year old loves his new closet and all of our closets and kitchen pantry are Elfa. Rated 5 out of 5 by Bluebirdgirl from Great addition to Closet My Elfa closet from a few years ago felt crowded and needed reorganized so I added more shelves. The shorter depth works great with existing plan. Thank you fir making my life simpler with better organization! Rated 5 out of 5 by MrsStaples from Bedroom closets Purchased the elfa ventilated shelving to use in our bedroom closets. They are tiny 1950's closets that just weren't suiting our needs in the best way. Purchased elfa and I am so glad I did. We installed ourselves and had no issues. Shelves were easy to put up and have been great so far. Will buy again for the other bedroom. Rated 5 out of 5 by Lunabrigitta from Laundry Beautiful Elfa wire ventilated shelving is an amazing tool for organization. Can be cut to custom fit any size and allows for ventilation and easy view of what is on shelf. We combined platinum wire shelving with white fascia trim and solid white shelves, hanging laundry baskets and krinkle decorative storage. The laundry looks sleek, modern, clean yet is extremely efficient and customized to our needs. Rated 5 out of 5 by BGGwynn88 from Elfa ventilated shelving is high quality and lasts I have been purchasing Elfa shelving since the early 2000s. It is one of the best products a homeowner can buy. You install it once and you will never have to redo your closets again. I have used Elfa ventilated shelving in my closets, my utility room, and my shed. I only have one more closet to redo. Easy to install--I design my own closets and do my own installation. I am a 64 year old woman. This shelving does not get sticky and it will support a tremendous amount of weight if you follow the installation instructions. All components are designed to last. LOVE Elfa! Rated 5 out of 5 by BobsJaye from New Laundry Room! I am a huge fan of the ELFA system. This past weekend I tackled my laundry room (while my husband was out of town! Girl Power!) and am so happy with the results. I was able to more than triple my storage space by using the ELFA system and your helpful designers! Rated 5 out of 5 by elfainNY from Organized crafting Without my re-positionable Elfa shelves, this super crafty closet would be super chaos. As I use or acquire new material, I can adjust the shelves to keep it all organized. Rated 5 out of 5 by harjo from These are the best! We have now done three closets with the Elfa shelving systems. They are very sturdy and because of how they are designed and all the pieces that are available, we were able to maximize the space in the closets. They are easy to install and look great. Rated 5 out of 5 by catsandroses from Elfa closet systems.. just the best.. for 34 years I have been using Elfa products a long time. I bought my first basket systems in the early 80's and never looked back. I always hated dressers and the basket system worked wonders.. I used it in my kids rooms as they grew up as well as the master bedroom, basement and garage.. Now I am living in a new home in another state and my original Elfa baskets are STILL in use.. the old frames and baskets are in storage areas and work great while newer frames and mesh baskets are in our master bedroom and guest room closets.. The rest of the closets are done with the Elfa shelving. I love their clean stream lined look and their endless flexibility.. they have been going strong for 34 years now and I see no end in sight! Rated 5 out of 5 by MS2952 from Platinum elfa Ventilated Shelves Very durable and very easy to install, however, it takes some time between the time of placing the order and the time it is shipped. Rated 5 out of 5 by Campbells from Best Organization Turned out better than expected. 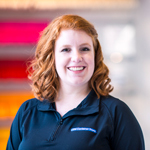 The employees were very helpful with designing our space and choosing the right fit for our area. The Elfa Ventilated shelves look great in our closet, bathroom, tv area and in our craft room these are very sturdy and stylish. Do you have 12&quot; deep elfa ventilated shelves longer then 4 feet? I am looking for 59&quot;. No, you would need to use a 24&quot; combined with a 36&quot; cut to 35&quot;. Is the 4' long shelf available in depths greater than 12&quot;? Yes, 4' elfa Ventilated Wire Shelves are available in 12&quot;, 16&quot; and 20&quot; depths. We can also custom cut the shelf length to fit your particular space. Contact us at 1-888-CONTAIN (266-8246) for further assistance. I have a 26&quot; deep closet that I would like to use most if not all the depth. Do you sell shelves that deep? If not could I hang two 12&quot; shelves one in front of the other to create a 24&quot; depth? I have a reach in closet. No you can not. The brackets are fit for the wire shelf so go smaller like 18&quot;. If I purchase the 16&quot; X 4' shelf, will I need a middle bracket for support or will the brackets on the ends only work? I need to trim 1&quot; off one of the ventilated wire shelves in my closet design. What is the best way to cut the shelf? The Container Story suggests using a bolt cutter. I tried but it left a ragged edge. Instead, I used a power jigsaw with a metal blade. Much better. Easier, too. Can the ventilated shelves extend beyond the brackets at the ends? I'd like to be able to size the shelves for a large project to fit the various closet widths of an apartment building. Can the ends of the ventilated shelves overhang past the brackets? It is not recommended to extend the shelves beyond the brackets. However, I have successfully overhung the shelves by about 2 inches and had no problems. Obviously, you must use common sense as the shelves will not support as much weight in this configuration. In my case, the shelves were storing sweaters in a small closet where I appreciated the extra 2 inches (and I was too lazy to cut the shelves shorter). HOw close to the top of the hanging standards can I place a shelf? Very close to the top, but if they are up against your ceiling, you would have a shelf that is only a few inches from it. If you are combining wired shelves to span a longer distance, do you need a shelf bracket on each side of each shelf? Or can 2 shelve share a bracket? Shelves can share a bracket. In the photo below, the top three shelves all share their middle brackets. I used two 3' shelves to make one 6' shelf for the top three.